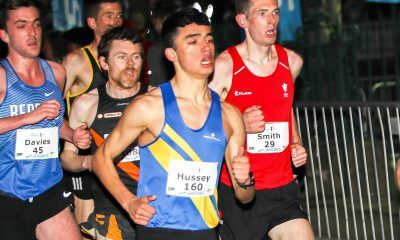 When the Aldershot, Farnham and District runner stormed to a dominant victory at the latest Podium 5k he ran without a watch, breaking the course record in the process. Former elite duathlete Richard Allen – he is the reigning U23 World Duathlon champion – runs free of all technology when racing, preferring to race ‘naked’. 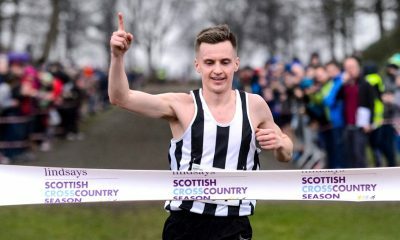 It clearly did the 22 year-old no harm at all at the increasingly competitive Podium 5k event at Barrowford, as he ran 14:05 to slice 14 seconds off Olympian Tom Lancashire’s previous record in one fell swoop. Super running once again at the @podium5k last night! Richard Allen broke the course record and Mhairi Maclennan ran a big PB to take the women's honours. Perhaps due to the fact he’d run a 13:51 personal best at the previous month’s Ipswich 5k (where he was narrowly beaten to victory by one second by Belgrave’s Nick Goolab) he was confident he could “have a go” at the Podium course record. It was an intriguing sight to see the AFD runner striding out hundreds of metres ahead of his nearest rival, completely unaware of what pace he was running or what his heart rate was, wearing his club vest and shorts and trainers and nothing else. The contrast between the dominant winner’s attire at Podium and the majority of the field nearly a minute behind was striking, with almost all competitors wearing at least a watch – most of those GPS and HR-monitor enabled – and some also wearing compression socks or arm warmers, technology claiming to encourage more efficient blood flow during exercise. What does Allen have to say about running ‘tech’? “I’ve never raced with a watch and I don’t think that will ever change,” he explains. “I understand people like to know their splits and I like to do that in training, but to me racing is an opportunity to forget about all that and enjoy the experience – your watch won’t make you run any faster! Allen’s refreshing attitude to running ‘tech’ in a world increasingly swamped by sports technology companies claiming to help runners of all abilities improve their speed and stamina with the help of the latest GPS watch, compression gear or head visor stands out. His impressive successes as a GB U23 and senior duathlete may have had an effect on his approach to race technology, though, as it’s notable that many top athletes in duathlon and triathlon race watch-free. Since Allen gave up triathlon training at the end of 2017, he has sliced more than 90 seconds off his 10,000m PB (he ran 28:54.95 at this year’s Highgate Harriers Night of the PBs) and has also made significant inroads into his 10k road best. However, it is likely that his years of training on the bike and in the pool alongside running have given him a supercharged engine to race with – and he still cycles and swims, just not in competition. He acknowledges that, along with the obvious benefits of multiple discipline training have had on his fitness, the fact that he can now concentrate more on his running has paid dividends in his race performances this year. “I had to make a decision between duathlons or running and decided to focus on running, which I think has helped, as well as a progression in my training volume,” he adds. That’s all changed now, and, as a consequence, he is achieving the times he is well capable of, and he’s still only 22. 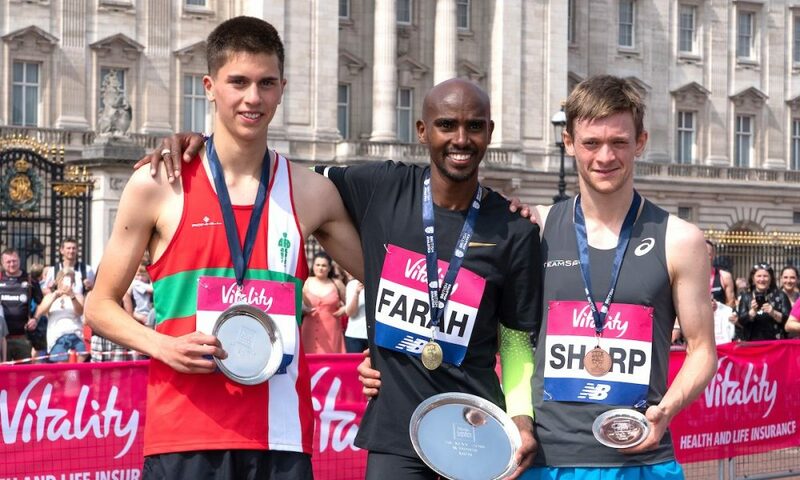 One of Allen’s more well-publicised performances this year was his second place at the London 10,000 road race in May, where he finished runner-up to multi-Olympic gold-winning track legend, Mo Farah. The two athletes ran alongside each other for much of the race, with Farah encouraging the young AFD star to keep in line with him as they wound through the streets of the capital, well ahead of big GB names including Callum Hawkins. 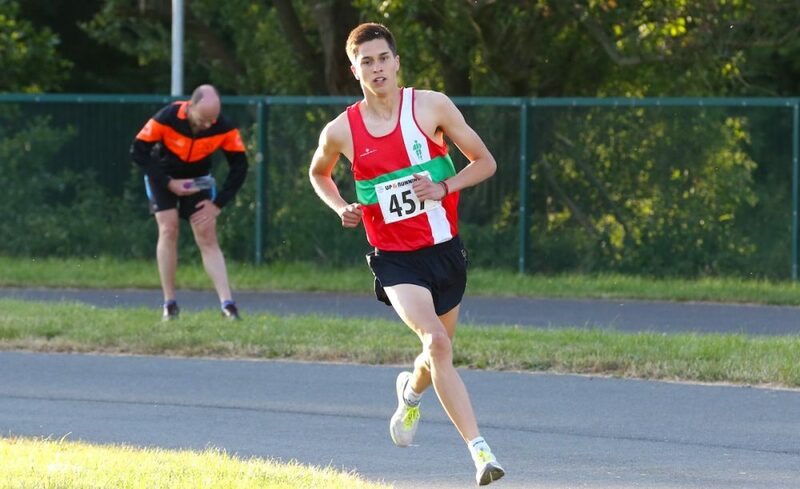 Although it is only this year that Allen has really shone under the national athletics spotlight, he has an impressive pedigree of English Schools results, two of which stand out for the 2018 English 5k champion, along with the first time he broke 30 minutes for 10k back in 2016. 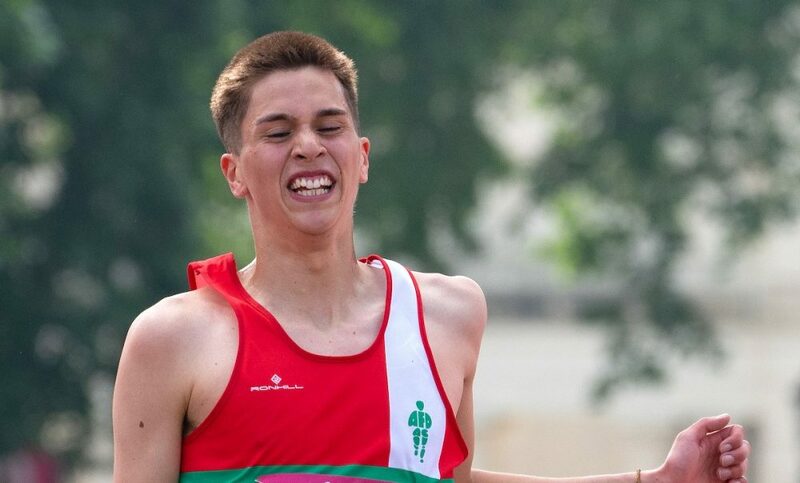 He reveals: “Winning two bronze medals at the English Schools as a top year Inter and then as a senior for 3000m were big highlights for me. I enjoyed the whole experience not just the race, as it was the first time I felt like an elite athlete. It meant a lot to me, although I did find it challenging once I had outgrown the English Schools. 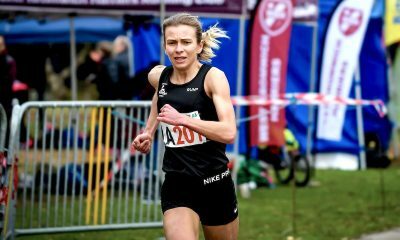 Fittingly, his victory at the Mid-Cheshire 5k – which doubled as the England 5k championships – is a big feather in his increasingly brimming hat, a win which he admits “was a surprise to win”. 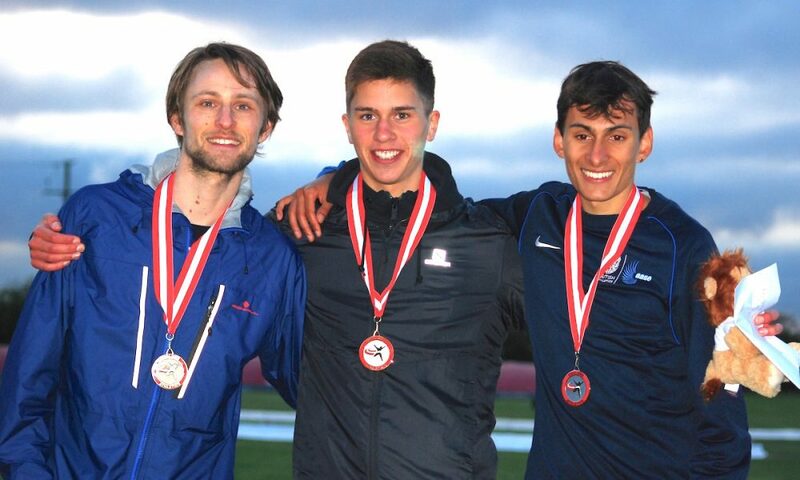 “It was even better to share the podium with my training partner, Emile Cairess, (Leeds City’s 13:54 5000m athlete)” he adds. The Huddersfield-based athlete is clearly capable of attacking the European Championships 5000m qualifying time of 13:42, but he remains refreshingly grounded about his aims for this year. Allen spent two years at the University of Leeds, where he was based for his triathlon and duathlon training, but left last Christmas when he decided to concentrate on running instead. It certainly sounds like Allen has got the right attitude to balancing training with the rest of life’s demands. He runs between 60-65 miles a week – much of that with Phil Townsend’s endurance group at Leeds City AC – alongside swimming and cycling, and does strength and conditioning twice a week, following a programme written for him by Tim Jarrett at Leeds Triathlon Centre. If his achievements this year since concentrating on running just six months ago are anything to go by, the future is bright for the athlete who likes to ‘run free’, breaking records as he goes.